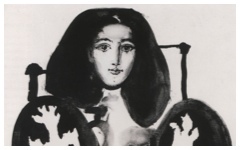 We showed in Picasso’s Portrait of a Girl and a Bull that he had used the word YO (the Spanish for 'I') several times on drawings in 1900 and 1901 and again in 1942. Now we show how Picasso continued to use YO to indicate his own presence in someone else’s figure towards the end of his life. Piero Crommelynck was a master printer who worked side-by-side with the great master for the last ten years or so of Picasso’s life. 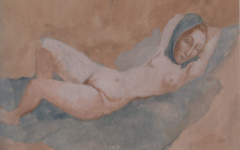 No-one save the artist's women appears so many times in Picasso's oeuvre. 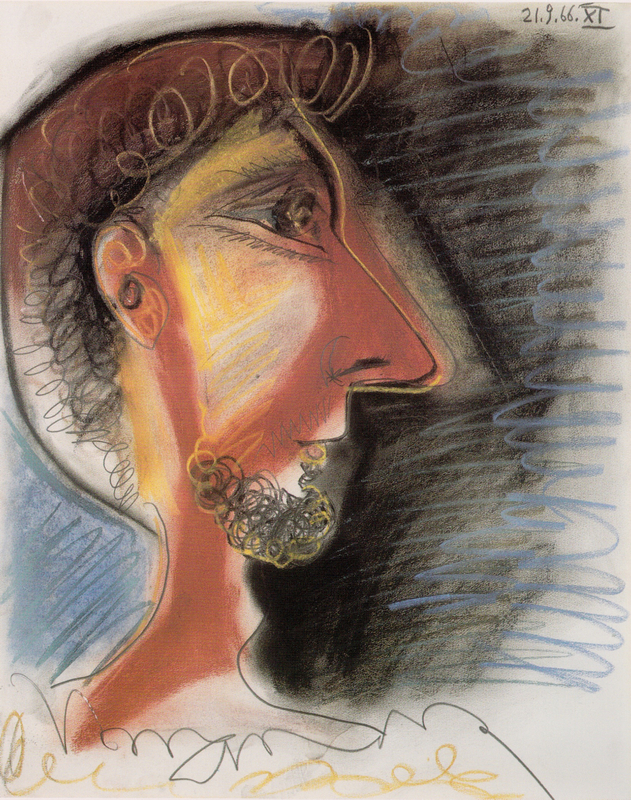 Art historians have rightly noted that one reason Picasso was so interested in Piero’s appearance was that his physiognomy bore a striking resemblance to that of Picasso’s own father, a character who haunts Picasso’s art in a variety of different guises.1 Nevertheless, as we continue to stress, all figures by an artist – even a representation of his father in the guise of Piero – is still an aspect of the artist’s own mind. 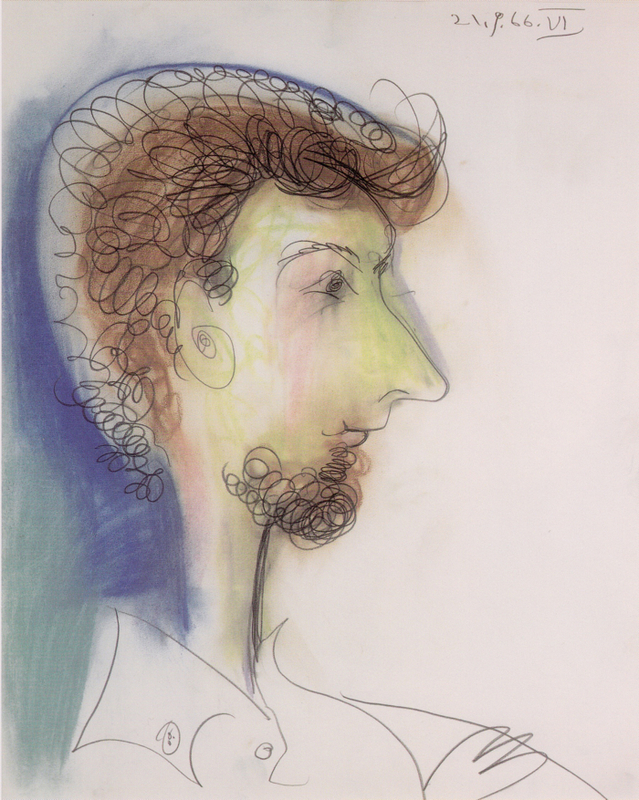 Let’s first look at a sketch of Piero from 1966. See how the ear is drawn like a spring with the depth of the ear-hole represented by an increasingly tight spiral. In a more finished drawing the ear-hole has become a circle. It would resemble an ear-ring if it had been drawn lower down but where it is, with a hollow center, it looks odd. The “shadow” on his face, though, is equally strange, in the shape of a Y. When the two forms are seen together, in the mirror of the artist’s own mind, the letters spell Y O as in a mirror. 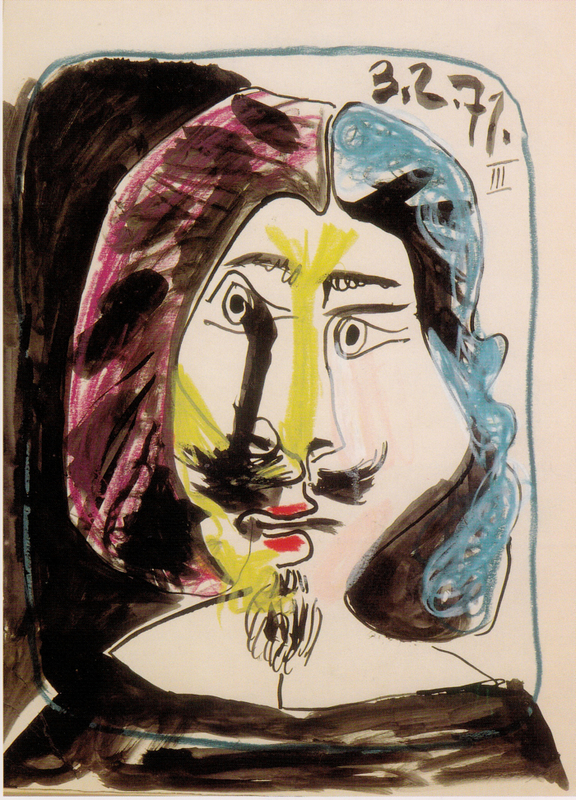 Only those aware of how often Picasso used YO would then recognize that the yellow line of this musketeer’s nose and frown (again based on Piero) spells Y with the eye and pupil next to it - on either side and as on either side of a mirror - as the O. This time, significance is added by making the Y fork out towards the top of his head. Combined with the O's of his eyes Picasso indicates for those that can see the combined importance of the artist's eye and mind. Never forget the importance of an artist's hand. It can pop up anywhere. 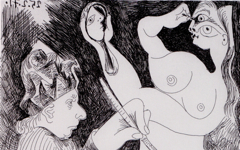 Just like Michelangelo's, Picasso's women are masculine too....here's how and why. Original Publication Date on EPPH: 06 Jan 2011. © Simon Abrahams. Articles on this site are the copyright of Simon Abrahams. To use copyrighted material in print or other media for purposes beyond 'fair use', you must obtain permission from the copyright owner. Websites may link to this page without permission (please do) but may not reproduce the material on their own site without crediting Simon Abrahams and EPPH.